Curran: "We need to be sure that our young people are being taken to and from their prom by drivers who are licensed to operate within Nassau County." 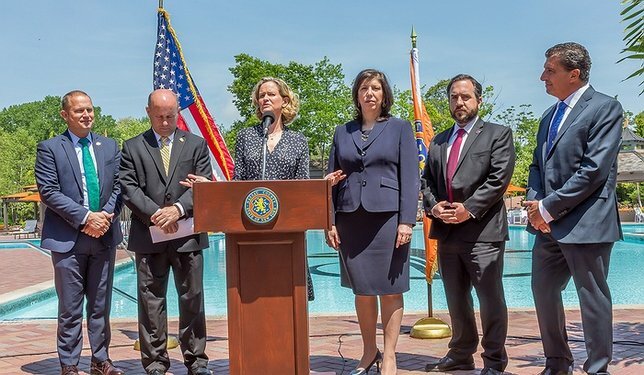 Nassau County Executive Laura Curran announced efforts to identify unlicensed for-hire vehicles operating during prom season. Mineola, NY - June 1, 2018 - Nassau County Executive Laura Curran today joined with District Attorney Madeline Singas, Police Commissioner Patrick Ryder, Consumer Affairs Commissioner Gregory May and Crest Hollow County Club CEO Richard Monti to announce increased, multi-governmental efforts to identify unlicensed limousine and for-hire vehicles operating during prom season. The enforcement will also include safety checks will target limousines, taxis and vehicles driving for Uber and Lyft. To date, 27 Violations have been issued by the Department of Consumer Affairs across three proms so far this season. NYSDOT has issued three out-of-service notices for prom buses, two for inoperable emergency equipment and one for a driver driving with a suspended driver’s license, according to Commissioner May. Subject: LongIsland.com - Your Name sent you Article details of "Nassau Executive Curran Announces Increased Unlicensed Taxi and Limousine Enforcement During Prom Season"